There are few iconic celebrities who make the select group of people painted again and again throughout history. Religious icons have secured most of the top spots, but there is one much-loved individual who has also made his mark many times. We're talking, of course, about Saint Nicholas or Father Christmas. *Spoiler alert: This post is about to detail spoilers about Father Christmas. Father Christmas, or Santa, is a character based on the real life fourth century archbishop, Saint Nicholas of Myra, Asia Minor (known today as Demre, Turkey). Well respected for his regular miracles of resurrecting children and saving men from drowning at sea, Saint Nicholas was made patron saint of sailors, merchants, children and much more. Saint Nicholas was also widely known for his secret gift giving, a trait that directly inspired the creation of modern day Father Christmas. Usually found in Russian Eastern Orthodox paintings, Saint Nicholas sports a modest white, fluffy beard and his archbishop robes. Medieval depictions of Saint Nicholas often portray him as having darker skin, a complexion akin to the people of his Myran origin. Here was see him with darker skin and a bald head, surrounded by famous scenes from his life like resurrecting three children from a wooden barrel. Many people believe the red worn by modern day Father Christmas was designed as marketing by the fizzy drink giant, Coca Cola. Although this colour definitely works in their favour, there are many paintings of Saint Nicholas wearing red archbishop robes that pre-date Coca Cola by hundreds of years – a good bit of trivia to use at the table during Christmas dinner! Unlike many saints whose bodies were divided and distributed to various churches after their death (for religious reasons), Saint Nicholas remains in one piece where he was laid to rest in Bari, Italy. Because of this, a team of scientists in the 1950s were able to analyse the body and reveal the man was barely five feet tall with a broken nose. 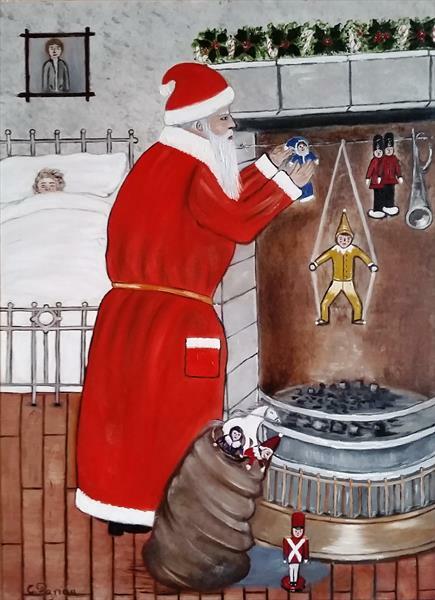 This painting from Austria shows how Saint Nicholas is beginning to become part of the Christmas scene and take on a role similar to the Father Christmas we know today. We see the classic depiction of the archbishop with the white beard joining in with the family's festivities and, importantly, holding a child's hand. This shows how Saint Nicholas's recognised kindness to children was used as a main theme for the character of Father Christmas. The character peering round the door on the left is known as 'Krampus', a popular figure in the Christmas story in Austrian and Nordic countries. Sometimes seen as the 'anti-santa', Krampus would punish naughty children. This, thankfully, did not make it over to the British interpretation. He's terrifying. One thing Saint Nicholas does not seem to have been is overweight – probably because the real Saint Nicholas didn't have to make his way through thousands of mince pies. In this painting by Ilya Repin, he is notably thin, but still supports the iconic white beard. Whilst the real man is still being painted, the character Father Chirstmas began to model for several paintings, etchings and illustrations by this point. One of his most famous debuts was a starring role for Mason's wine essences – yes, he became a commercial man very quickly! During the early 1800s, Father Christmas kept a relatively low profile so as not to be associated with the Lords of Misrule. By the 1900s he made a full comeback and was a well-established figure appearing in many famous paintings and adverts according to his newly found official description in the Oxford English Dictionary. He is described as "the personification of Christmas as a benevolent old man with a flowing white beard, wearing a red sleeved gown and hood trimmed with white fur, and carrying a sack of Christmas presents". Magazines began to print pictures of a cheerful old man still in red robes and surrounded by food. 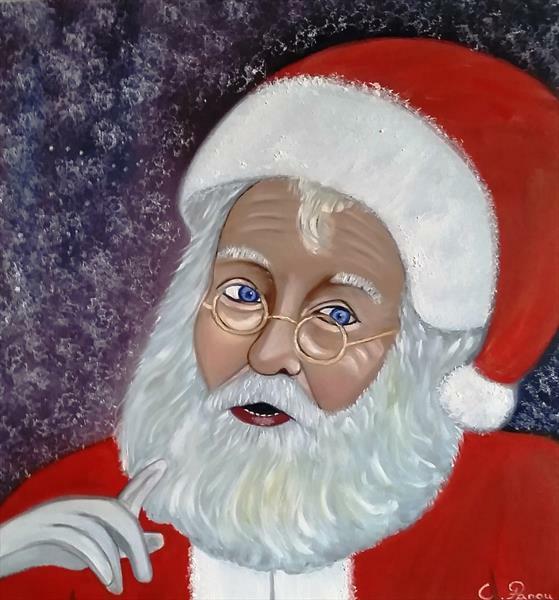 And to this day, Father Christmas lives on in art! See for yourself on our online gallery.